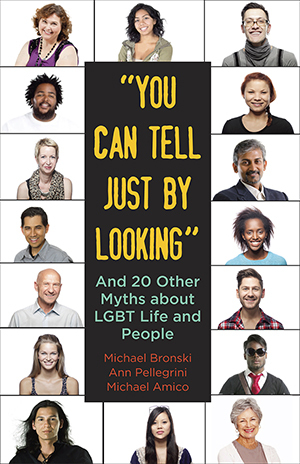 Beacon Press: "You Can Tell Just by Looking"
In “You Can Tell Just by Looking“, three scholars and activists come together to unpack enduring, popular, and deeply held myths about lesbian, gay, bisexual, and transgender people, culture, and life in America. Myths, such as “All Religions Condemn Homosexuality” and “Transgender People Are Mentally Ill,” have been used to justify discrimination and oppression of LGBT people. Others, such as “Homosexuals Are Born That Way,” have been embraced by LGBT communities and their allies. In discussing and dispelling these myths including gay-positive ones the authors challenge readers to question their own beliefs and to grapple with the complexities of what it means to be queer in the broadest social, political, and cultural sense. "One of the most complete sourcebooks about science, sociology and LGBT life out there." "This groundbreaking book is rich in smart, stirring, and forthright examinations of myths, negative and positive, and clarifying examples, and holds to scholarly standards while compellingly and revealingly addressing the curiosity and concerns of mainstream readers." "This powerful book demands that we look more closely at the ways we move in and structure our society, and asks vital questions that will steer the culture toward justice and equality."